The exposome has been described by Wild as the measure of all of the exposures an individual has in a lifetime and how those exposures relate to health. 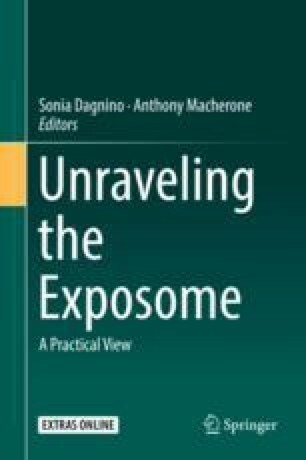 The exposome represents the totality of exogenous (external) and endogenous (internal) exposures from conception onwards, simultaneously distinguishing, characterizing, and quantifying etiologic, mediating, moderating, and co-occurring risk and protective factors and their relationship to disease. The exposome provides a systems science approach to bringing together and organizing data needed to model the relationships, mechanisms, and pathways among and between external exposures, endogenous exposures, health outcomes, and population-level health disparities. It holds promise for identifying completed exposure pathways from source of exposure in the natural, built, social, and policy environments to route of entry into the body, biomarkers of exposure, biomarkers of disease, disease phenotype, clinical outcomes, and population level disparities, across the lifespan, and between generations. This chapter proposes a new taxonomy for sequencing the public health exposome first described by Wild as the eco-exposome. The aim of this chapter is to identify a common taxonomy for conceptualizing and operationalizing environmental exposures as an important step towards articulating a science of health disparities.